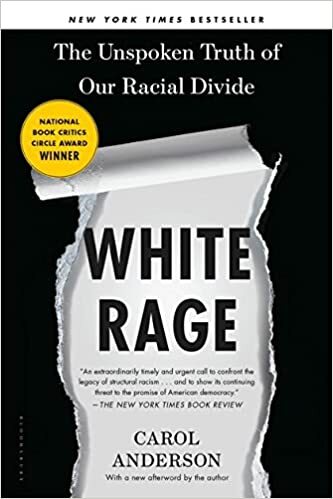 White Rage: The Unspoken Truth of Our Racial Divide – loudlatinlaughing – Euge! Euge! Carole Anderson’s book should be assigned at birth to anyone with white skin. I’m not sure how she manages to pack in so much history into so few pages without bursting with rage herself. Post Civil War Reconstruction was a terrible period, Southern white resentment at federal meddling causing inexcusable terror to be brought upon the newly freed. Once Andrew Johnson (Lincoln’s VP from Tennessee) assumed the Presidency, all hell broke loose. Johnson said “This is … a country for white men, and by God, as long as I’m President, it shall be a government for white men.” Southern states went about immediately trying to “Reconstruct” life as it had been under slavery, passing the notorious Black Code laws that required annual labor contracts to be signed, and anyone who wasn’t working could be arrested for vagrancy. Blacks couldn’t hold any jobs except laborer or domestic unless they had the written consent of the mayor, and were banned from hunting and fishing. Punishment was by whipping. Here’s an unpleasant surprise: Mississippi delayed their ratification of the 13th Amendment until 2013. Lovely. Anderson then tackles the Great Migration (read Isabel Wilkerson’s amazing book for more detail) and the fight to get equal education. Next came the Civil Rights movement, which was when racists went underground. Her final chapter is on Obama’s historic presidency, bringing all the racists back out again. He had 4x the number of death threats than George W. Bush. The book is extensively researched and annotated. I doubt you’ll be able to read it without feeling some rage against the awful society America has inherited.